How does one celebrate a milestone, such as 300 posts, if not to celebrate the voices that matter most. Those people who have spent the time to stop by and add to the conversation. In the past, I have written posts compiling comments across a year or curated responses to the problem of practice shared out on Twitter, but what interests me is what it means to others to be a part of the village? Hearing an early career teacher talk about her aspirations of becoming a principal reassured my optimism for the future of education…only then I heard experienced teachers say something along the lines of ‘can you believe the level of confidence?’ and ‘get through your first five or ten years first’. I have previously encouraged early career teachers to present, only to hear the concern of what others would think. I‘ve blogged about the Tall Poppy syndrome which is familiar to many Australians. On the flipside, I’ve known of early career teachers who believe that after their first year, they’ve ‘got this’. There is a fine line between confidence and arrogance. If we invest in our early career teachers through coaching, could we influence their confidence, while modelling humility? Arrogance in education has no place, but confidence on the other hand, is about trying to improve oneself, which is vital for all teachers and learners. It was inspiring to learn about the tall poppy campaign developed by the Australian Institute of Policy and Science. Young Tall Poppy Science Awards aim to recognise the achievements of Australia’s outstanding young scientific researchers and communicators. It is up to us to encourage, guide and inspire all our colleagues and I for one, would love to turn around the concept of the ‘Tall Poppy’ and make it a positive attribute of all teachers. Just imagine what more we could achieve, if we supported and promoted all our teachers, especially the early career teachers who enter this profession intrinsically motivated and enthusiastic. Being a connected educator is essential to all aspects of my teaching life. I cannot imagine being the teacher I am, without my PLN. The idea that ‘it takes a village’ is central in my beliefs of being a connected teacher. 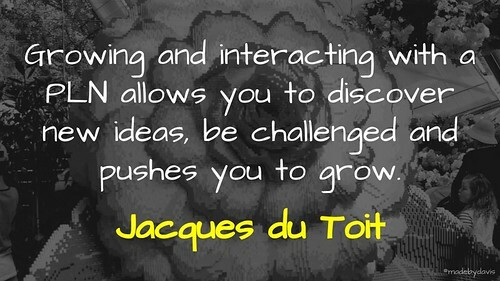 Growing and interacting with a PLN allows you to discover new ideas, be challenged and pushes you to grow. 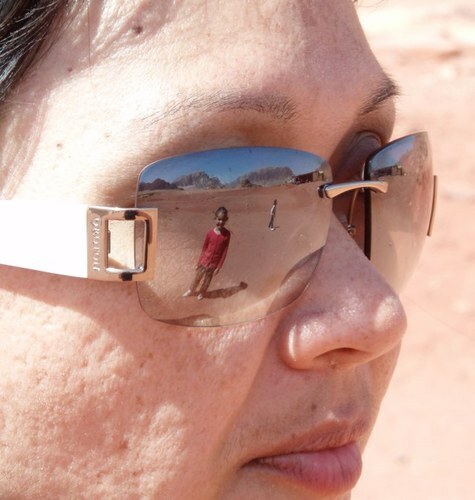 My PLN keeps on evolving, and I love the diversity of ideas, opinions and interactions. I strongly believe in the power of being a connected educator, sharing ideas and conversations. 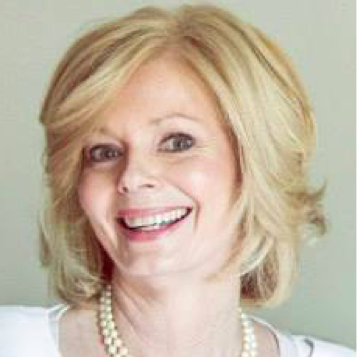 I happened on your blog after connecting with you at GTA Sydney 2014, but it has been our interactions and communication that has allowed me to grow in admiration of what you do. I admire your efforts in writing, sharing and connecting. and it set my heart aflutter. and spread beyond your neighbourhood. for bothering to keep in touch. and all the way across the “pond”. please remember, we, your followers, care. I read a lot and usually find inspiration from tweets such as yours. 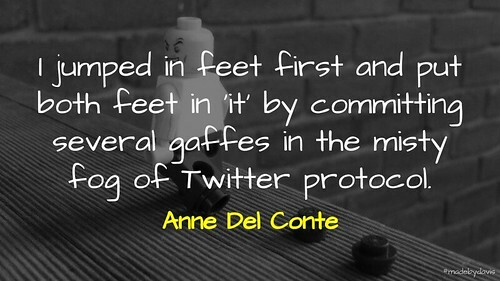 Twitter is like my faculty! Thank you for taking the time and initiative to raise the concept of ‘it takes a village’ with me! That might actually be my best advice to any blogger – don’t overthink it. If an idea crosses my mind I just write it. 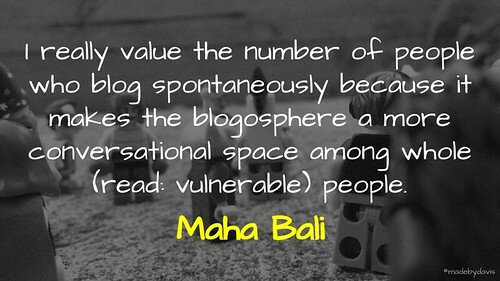 Sometimes straight to my blog, sometimes to another venue that will get more widely read…but I really value the number of people who blog spontaneously because it makes the blogosphere a more conversational space among whole (read: vulnerable) people. It takes a village to raise a teacher. Everyone has something to share and everyone has something to learn. We aren’t alone and in a digitally connected age we never should be. I think that this phrase speaks to the complexity of teaching. None of us have all of the answers to the myriad of professional dilemmas that we grapple with, on a number of levels, every day. 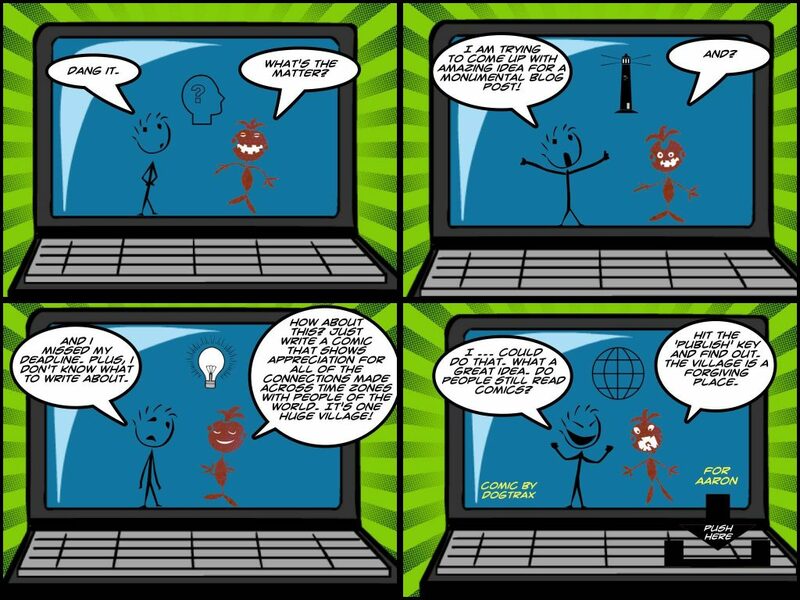 By connecting online, I’d like to think that we are each sharing our thinking and ideas and drawing on those of others for the benefit of our students. The complexity of teaching stems from the fact that every one of our students are unique, as are the interactions in every one of our classrooms. What works for me might not work for you but what works for me might just nudge your thinking towards something else that works in your context. Reciprocally, by distilling my thoughts into 140 characters, or being discerning about links and resources I share, and sending them out to the world, I invite feedback and dialogue. 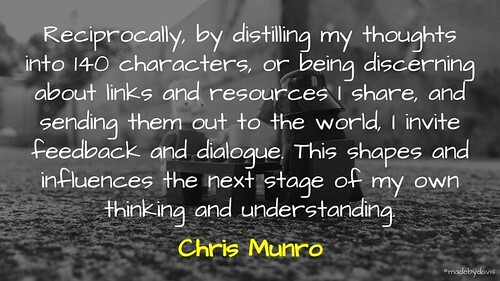 This shapes and influences the next stage of my own thinking and understanding. We are not going to put the [education] world to rights but we are doing our own small bit for the greater good. I often ponder how the many years of relative isolation in my early career (I started teaching in 1992) might have been different. How my learning might have been accelerated by exposure to voices beyond the walls of my school and local area. What I do know is that, until my engagement with Twitter (and subsequent graduation to blogging), the breadth of my professional conversations was quite limited. I had my own department within my school supplemented by occasional face to face contact with a wider network of people (most often working in the same subject area as me). These external voices were part of local associations, national bodies and the very occasional conference. All too often though, these fora were about sharing resources and socialising (no problem with that) rather than discussing their application in context. It was not until I had the privilege of working in Initial Teacher Education that I came into more regular contact with a wider range of perspectives on education and some global voices. But even then, dialogue was still limited by hierarchies, opportunities and physical constraints on time and space. I remember my anxiety at putting out my first tweets. I was cautioned by some peers against sharing too much. Someone might steal your ideas and materials! Thankfully I didn’t see it that way. I reached out to connect and learn. 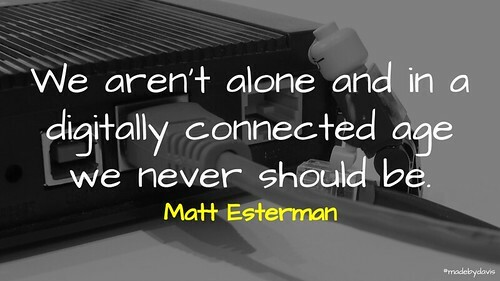 Now I can’t imagine not being a connected educator. I’m very grateful to be part of the global education village. And a final footnote: I’m now living and working on the opposite side of the world from where my career began but more connected than ever! Connected learners have an intuitive sense of the value of their social networks. Easily described, but can the value of a learning network be quantified? 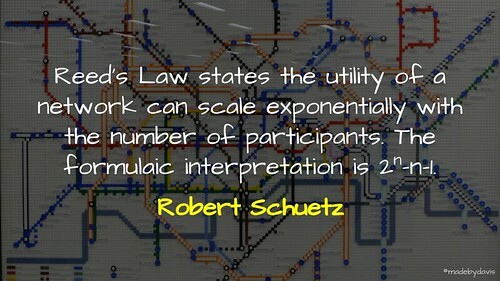 Reed’s Law states the utility of a network can scale exponentially with the number of participants. The formulaic interpretation is 2n-n-1. Of course, for this principle to be maximized every participant needs to be a contributor to the network. In other words, all villagers must share. I’ve been thinking a great deal about the internet lately. I’ve been thinking about what was promised when I first started tinkering with html and Mosaic browser (I never actually learned much html. Just enough to be a little dangerous). What I’ve been thinking about is how the internet promised the democratisation of information. It promised to be a place where everyone had a voice. What it very quickly seemed to become to me was a marketplace. The voices were all touting their businesses and the information was all tainted by vested interest. Even when individual voices could be heard they were mediated by business and advertising and therefore they were only for those worth advertising to (teenagers, basically). MySpace passed me by, and I was late to Facebook, and it felt as though what was promised in 1995 was a long-forgotten “non-core promise” that circumstance had rendered untenable. 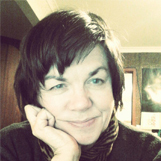 I don’t remember how I came across readingwritingresponding.blogspot.com.au. It was probably as a result of attending ICTEV13. Anyway, I came upon this post and I disagreed with it wildly. Aaron’s post challenged me in ways that made me uncomfortable and forced me to give reasons why not everyone should be using their voice online. Basically, it forced me to add my voice to the village. And in doing so, I found the internet that I thought was going to exist in 1995. Aaron is my village square. He’s the place I go when I need to connect with educators outside my own school. I stay at home (metaphorically) a great deal. When I venture out, the village square is still there. Aaron is still speaking and inviting other voices to add to the conversation and the learning is ubiquitous. 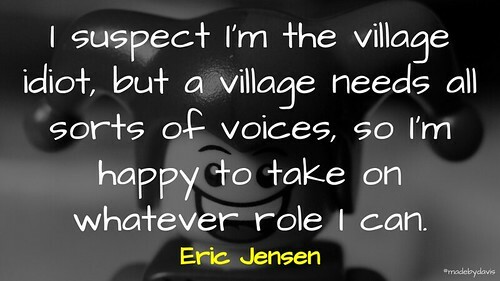 I suspect I’m the village idiot, but a village needs all sorts of voices, so I’m happy to take on whatever role I can. So, happy 300 Aaron. Many happy returns of the day. It takes a village. This proverb has unified you and I in so many ways as learners. 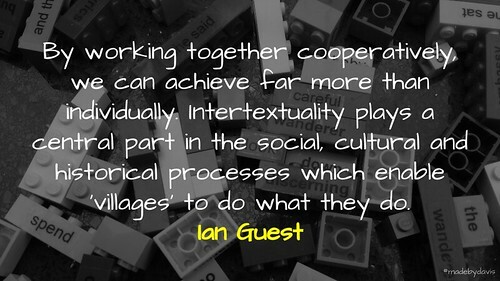 From connecting online through to co-presenting face to face, we have both seen the immense value that co-learning can bring. My best professional learning experience is still our co-presentation at DLTV. We had been enriched beyond our wildest expectations before we had even presented. The experience has continually resonated with me because we were both willing to contribute, to question, to listen, to speak up and I know we are both forever changed as a result. How many professional learning experiences can boast that? Not many I would imagine. The village process sparked so many ideas and I want to give that experience to other members of the village. I created CoLearn as a direct result of our village learning experience. CoLearn is about being willing to contribute to the learning of other learners and to be willing to have others contribute to yours. It is about co-learning together, providing a critical friend and hopefully sparking change and innovation in your classroom. CoLearn is “it takes a village” personified and I think is way for real change to happen in schools. I want to thank you Aaron for being a part of my village. I’m currently working on an assignment for the Discourse and Linguistics module I recently completed. With that at the forefront of my mind, it’s hardly surprising that it colours this post. Without his permission, I wouldn’t dream of undertaking an analysis of Aaron’s blog, however there’s a feature on which he draws heavily, and which also speaks to the theme he provided – intertextuality (Kristeva, 1986). Most of what we say or write we’ve heard or written before. Our social encounters and experiences, personal and professional, have shaped our thoughts. In turn this contributes to the knowledge from which we draw and the meanings we construct. When we make an observation or express an opinion, we do so using the words we have heard (or read) and the images we have previously seen. Sometimes we do this explicitly, making the source of those words clear by using quotation marks, or using other indicators. Often we are less aware of a specific source, but know that what we are saying belongs to a particular discourse, for example classroom practice or technology integration. This link between the text we’re producing and those which preceded it is called intertextuality. It also pays forward into those texts which succeed it and together this chain, or network of texts constitutes horizontal intertextuality. Vertical intertextuality links our text with the others written, not referenced or drawn from, but which work within the same discourse. Those texts may be in the same medium (blogs), the same mode (‘written’ text), or indeed be different media or modes. Aaron assiduously references other posts he has written, helpfully drawing together themes across his work, indicating ways in which we might make meaning for ourselves. This is termed an intertextual collection, and because the overarching theme is centred on education (or perhaps more evocatively, learning), it could also be said to constitute disciplinary intertextuality. It is important to remember that when producing our own text, we not only reproduce the texts of others, but transform them. If I was teaching the origins of the Universe for Y9 students for example, I would need to turn the texts I have accessed over the years into one accessible to a 14 year old. Perhaps Aaron does similar work to this in ensuring his writings are accessible to a broad readership, but also to challenge our reading and understanding; pushing us to think afresh to produce our own texts. 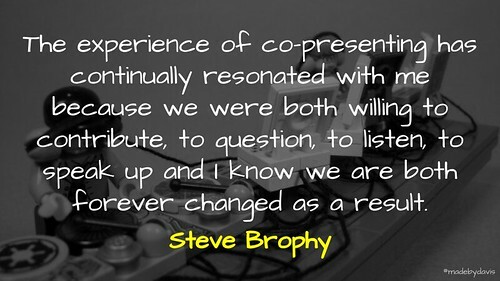 A presentation seen and heard at a conference would be transformed both by being summarised, and turned into a different mode of representation. It would be remiss to comment on READWRITERESPOND without remarking on the obvious additional affordance that being on the Web provides and which extends intertextuality. Hypertext. 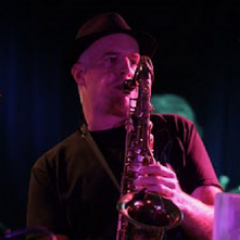 Few educational bloggers I read are as intertextually prolific through hyperlinks as Aaron. Some hyperlinks are explicit and reference other texts dually, both through a quotation or title, and through the hyperlink markers of different coloured text and mouse-over supplementary information. Other links are implicit, using the markers alone, but hinting at where the hyperlink might lead through the words themselves. Hypertextuality extends the meaning potential of the post immeasurably. Although as readers we have some agency in how we read and make meaning from a text, we are nevertheless guided by the order the author has provided. With hypertext however, we have far more choice in how we construct our knowledge, by following links to other texts, and if we feel so inclined, beyond those too. Our learning chains or ‘traversals’ (Lemke, 2002) are as different and individual as we are. Often those with the largest followings generate the greatest impact & spread stuff virulently and unquestioningly. I’m not saying here that I ‘know’ what is or isn’t right. I equally see how it can transform usually inert educational behaviour in some into enmity as the scale and proliferation of uncritical consumption becomes apparent. I wonder why this phenomena occurs. The need to belong, to affirm, to simply connect people and ideas? Online, does groupthink, as it takes on a personality and entity of its own, serve to exclude rather than include others and arrest participation from outside? Again online, does groupthink slowly immunise itself from what it perceives as irrelevance from others? Does groupthink calcify its own attitudes or philosophies rather than welcome and accept that there is something good about variety? So what about you? 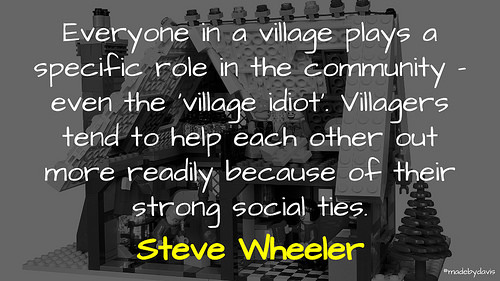 What does being a part of a village mean to you? As always, I would love to know. Feel free to leave a comment or write your own post. A Village Takes Many Things by Aaron Davis is licensed under a Creative Commons Attribution-ShareAlike 4.0 International License. Happy 300 Aaron! Thanks for including my ramblings in your celebratory post ? An honour and privilege to be part of the village.